To carry out chromosome segregation faithfully during mitosis, the mitotic spindle must undergo precise changes at appropriate cell cycle stages (reviewed in [1-5]). Defects in mitotic fidelity have been linked to diverse disease states including birth defects and cancer. Therefore, it is important to develop a deep mechanistic understanding of mitotic processes. Among the key unanswered questions concerning mitosis are the following: How are the forces generated? How is the precise choreography of events achieved? What mechanisms insure the high fidelity of chromosome segregation? How does each chromosome establish a bi-oriented attachment to the mitotic spindle? How are these attachments regulated? How are they monitored by checkpoints? How are the attachments maintained while tubulin subunits exchange at kinetochores? Our current understanding of mitotic mechanisms is derived from diverse experimental approaches used in diverse cell types, including animal and plant cells in culture, the Xenopus extract system, and genetically tractable “model” organisms. Because of the rich legacy of yeast cell-cycle studies, yeast is a premier organism in which to identify mechanisms used to coordinate changes in cytoskeleton organization and function with progress through the cell cycle. Owing to conservation in spindle components and their regulation, principles learned from studies on yeast and other genetically tractable organisms have proved relevant in complex eukaryotes. For example, gamma tubulin was first discovered genetically in the fungus A. nidulans , and studies on yeast and other fungi identified key components and general principles for checkpoint regulation, the metaphase-anaphase transition, control of chromosome cohesion, antagonistic forces created by spindle motors, chromosome capture mechanisms and bi-orientation establishment [7-17]. While studies in budding yeast have already contributed significantly to understanding of mitotic mechanisms, solutions to additional unresolved problems now seem attainable in yeast. For example, at least 60 proteins of the yeast kinetochore, the structure at the interface between chromosomes and spindle microtubules, have been identified and characterized. Studies of yeast kinetochore proteins provide a unique opportunity to elucidate principles governing the formation and regulation of this linkage, and many of these principles are likely to be generally applicable. Even though precise mechanisms sometimes differ , a mechanistic understanding of a process in a model organism facilitates progress in more complex organisms by establishing general principles and by generating testable hypotheses. In budding yeast, the microtubule-organizing center, or spindle pole body (SPB), duplicates following passage through G1. Because S. cerevisiae cells have a closed mitosis in which the nuclear envelope never breaks down, SPBs mediate organization of both extranuclear and intranuclear microtubules. The extranuclear microtubules are responsible for spindle movement and orientation, and they contribute to anaphase forces. Upon passage through G1, a bipolar spindle assembles and establishes attachments to each chromosome. In S phase, kinetochores are duplicated. Frequently, kinetochores on both sister chromatids are initially oriented toward the same pole. These syntelic attachments are corrected by the yeast Aurora kinase, Ipl1p . At metaphase, cohesion between sister chromatids prevents the spindle from elongating past a length of approximately 1-2 µm [19, 20]. At the onset of anaphase, chromatid cohesion is eliminated by the action of the Anaphase Promoting Complex (APC), a ubiquitin ligase that targets a number of proteins for degradation during mitosis [21, 22]. With the loss of cohesion, sister chromatid separation and spindle elongation occur to segregate the chromosomes. Finally, following spindle elongation, the spindle breaks down as the cells exit mitosis. Yeast genetics has proved to be an extremely powerful approach for identification of spindle proteins and for elucidation of their functions. These include force-generating motor proteins and proteins that regulate spindle microtubule dynamics and interactions. Importantly, complete three-dimensional yeast spindle reconstructions from electron micrographs have been achieved, providing a foundation for understanding mitotic and meiotic spindle mechanics in this organism [23-25]. Remarkably, from such studies it appears that there is only one kinetochore microtubule for each chromosome, and, early in mitosis, only about 12 interpolar microtubules. In late anaphase, the number of interpolar microtubules decreases to about 4. How each class of microtubule is formed and regulated, how their numbers are specified at each stage of mitosis, and how spindle integrity is insured, are important unanswered questions. Proteins that hold together the four interpolar microtubules of the late anaphase spindle, and provide them with sufficient stiffness to sustain anaphase forces, are likely to be critical for spindle integrity. Changes in the mitotic spindle, particularly the transition to anaphase spindle elongation, are under tight cell cycle control. In addition to the regulation by the APC and the cyclin-dependent kinase, Cdc28p, spindle function is also monitored by the spindle assembly checkpoint. This checkpoint regulation is mediated by a group of proteins that includes Mad1p, Mad2p, Mad3p, Bub1p, Bub3p, and Mps1p [7, 8, 26]. In response to spindle damage or an unattached kinetochore, the spindle assembly checkpoint directly inhibits the Cdc20p-bound form of the APC resulting in a metaphase arrest . In yeast, the metaphase arrest results in a large-budded cell with a short mitotic spindle and unsegregated DNA. A number of checkpoint proteins associate with kinetochores (e.g., [18, 28]). Kinetochores, multi-protein complexes associated with centromeric DNA, are needed to attach the chromosomes to spindle microtubules. The kinetochore is a main focus of our research. Remarkably, only 125 bp of DNA is required to insure chromosome attachment, sister chromatid cohesion, and the monitoring of these events by checkpoints. The simplicity of the minimal centromere DNA required for full function belies the great complexity of the yeast kinetochore. The high complexity and low abundance of kinetochore proteins explains why so much remains to be learned about how kinetochores function. Biochemical characterizations of kinetochore proteins have allowed them to be grouped into distinct sub- complexes [29-33]. The organization of these subcomplexes and their interdependencies in associating with centromeric DNA seem to be widely conserved from budding yeast to more complex organisms [30, 31, 34], allowing the investigation of broadly applicable features of kinetochore biology in a genetically tractable organism. A particularly important, albeit poorly understood role is played by the microtubule binding proteins of the outer kinetochore. 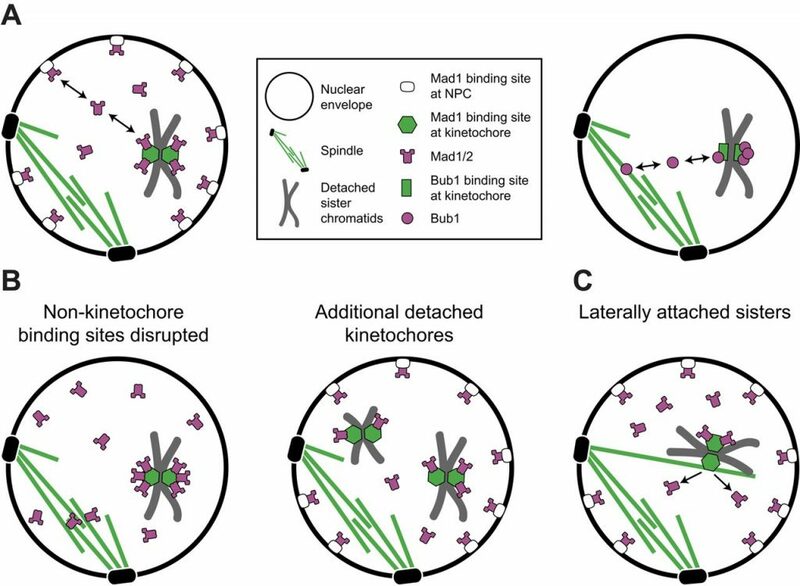 Kinetochores must attach to the spindle with high fidelity in order to avoid chromosome gain or loss. Importantly, this attachment must be maintained even though kinetochore microtubules are highly dynamic [35-37]. During growth and shrinkage of kinetochore microtubules, the attached chromosomes move vigorously back and forth, thus undergoing “directional instability”. How the kinetochore recognizes the plus end of a microtubule, allows the exchange of subunits while maintaining attachment, and mechanically couples the depolymerization of kinetochore microtubules to the generation of force necessary for chromosome movement, are fundamental unanswered questions in kinetochore biology . Detailed molecular analysis of chromosome segregation in budding yeast suggested an important role for non-motor microtubule-associated proteins (MAPs) in chromosome segregation . Among these MAPs are Stu2p, Bim1p, and Bik1p, the budding yeast homologs of XMAP215, EB1 and CLIP-170, respectively. Stu2p is essential for the dynamics of kinetochore microtubules [36, 40] as loss of function mutants lead to a reduction in the transient separation of sister chromatids . Recent biochemical evidence suggests that Stu2p can directly target and destabilize the plus end of a microtubule . The biochemical activities of other microtubule binding proteins at the kinetochore are less well defined. In an impressively innovative and ambitious study, Tanaka and co-workers designed an elegant in vivo chromosome capture assay, and assigned functions to many proteins in capture, transport, and conversion from lateral to stable end-on attachments . As elegant as this study was, capture was occurring under rather artificial circumstances and perhaps might therefore not have been entirely faithful to the normal process. Of special importance for budding yeast spindle function is the Dam1 complex (also called DASH). We identified Dam1p and Duo1p as essential proteins for mitotic spindle function . The Winey lab also identified Dam1p . Temperature-sensitive mutations in Duo1p and Dam1p showed two general classes of phenotypes: Broken-down, dis-organized or collapsed spindles, suggesting an important function in assembly and maintenance of the mitotic spindle [42-44], and massive defects in chromosome segregation [45-47]. Subunits of the Dam1 complex were found to associate with kinetochores as well as along spindle microtubules [44, 47]. After the initial characterization of Dam1p and Duo1p, additional subunits of the complex were identified by two-hybrid screens  or affinity purifications, [45, 46, 49, 50], bringing the total number of subunits to ten. The Dam1 complex is important for stable end-on attachments, but not capture . Importantly, the Dam1 complex is a key target of the yeast Aurora kinase Ipl1p in regulating kinetochore-microtubule attachments . Mutations that specifically prevent Ipl1p phosphorylation of Dam1p mimic the phenotype of Ipl1p temperature-sensitive alleles. Conversely, dam1 mutations that mimic constitutive Ipl1p phosphorylation are able to partially suppress an ipl1 temperature-sensitive allele , demonstrating the importance of Dam1p in the regulation of the microtubule-kinetochore interface in vivo. The Dam1 complex plays an important but not obligatory role in fission yeast, where kinesin-like proteins may perform functions partially redundant with the Dam1 complex [51, 52]. Recently, our lab and the Harrison lab characterized a Dam1 ring complex that forms collars on microtubules [50, 53]. We showed that the rings remain attached to microtubule ends even when the ends are disassembling, identifying a new class of biological motor. The existence of collar structures with such properties has been hypothesized for mammalian kinetochores [32, 38]. 1. Wittmann, T., A. Hyman, and A. Desai, The spindle: a dynamic assembly of microtubules and motors. Nat Cell Biol, 2001. 3(1): p. E28-34. 2. Andersen, S.S., Spindle assembly and the art of regulating microtubule dynamics by MAPs and Stathmin/Op18. Trends Cell Biol, 2000. 10(7): p. 261-7. 3. Heald, R., Motor function in the mitotic spindle. Cell, 2000. 102(4): p. 399-402. 4. Heald, R. and E. Nogales, Microtubule dynamics. J Cell Sci, 2002. 115(Pt 1): p. 3-4. 5. Winey, M. and E.T. O’Toole, The spindle cycle in budding yeast. Nat Cell Biol, 2001. 3(1): p. E23-7. 6. Oakley, C.E. and B.R. Oakley, Identification of gamma-tubulin, a new member of the tubulin superfamily encdoded by mipA gene of Aspergillus nidulans. Nature, 1989. 338: p. 662-664. 7. Li, R. and A.W. Murray, Feedback control of mitosis in budding yeast. Cell, 1991. 66(3): p. 519-31. 8. Hoyt, M.A., L. Totis, and B.T. Roberts, S. cerevisiae genes required for cell cycle arrest in response to loss of microtubule function. Cell, 1991. 66(3): p. 507-17. 9. Saunders, W., V. Lengyel, and M.A. Hoyt, Mitotic spindle function in Saccharomyces cerevisiae requires a balance between different types of kinesin-related motors. Mol Biol Cell, 1997. 8(6): p. 1025-33. 10. Hardwick, K.G., R. Li, C. Mistrot, R.H. Chen, P. Dann, A. Rudner, and A.W. Murray, Lesions in many different spindle components activate the spindle checkpoint in the budding yeast Saccharomyces cerevisiae. Genetics, 1999. 152(2): p. 509-18. 11. Cohen-Fix, O. and D. Koshland, Pds1p of budding yeast has dual roles: inhibition of anaphase initiation and regulation of mitotic exit. Genes Dev, 1999. 13(15): p. 1950-9. 12. Cohen-Fix, O., J.M. Peters, M.W. Kirschner, and D. Koshland, Anaphase initiation in Saccharomyces cerevisiae is controlled by the APC-dependent degradation of the anaphase inhibitor Pds1p. Genes and Development, 1996. 24(24): p. 3081-93. 13. Roof, D.M., P.B. Meluh, and M.D. Rose, Kinesin-related proteins required for assembly of the mitotic spindle. Journal of Cell Biology, 1992. 118(1): p. 95-108. 14. Severin, F., A.A. Hyman, and S. Piatti, Correct spindle elongation at the metaphase/anaphase transition is an APC-dependent event in budding yeast. J Cell Biol, 2001. 155(5): p. 711-8. 15. Tanaka, K., N. Mukae, H. Dewar, M. van Breugel, E.K. James, A.R. Prescott, C. Antony, and T.U. Tanaka, Molecular mechanisms of kinetochore capture by spindle microtubules. Nature, 2005. 434(7036): p. 987-94. 16. Tanaka, T.U., N. Rachidi, C. Janke, G. Pereira, M. Galova, E. Schiebel, M.J. Stark, and K. Nasmyth, Evidence that the Ipl1-Sli15 (Aurora kinase-INCENP) complex promotes chromosome bi-orientation by altering kinetochore-spindle pole connections. Cell, 2002. 108(3): p. 317-29. 17. Tanaka, T.U., Chromosome bi-orientation on the mitotic spindle. Philos Trans R Soc Lond B Biol Sci, 2005. 360(1455): p. 581-9. 18. Gillett, E.S., C.W. Espelin, and P.K. Sorger, Spindle checkpoint proteins and chromosome-microtubule attachment in budding yeast. J Cell Biol, 2004. 164(4): p. 535-46. 19. Michaelis, C., R. Ciosk, and K. Nasmyth, Cohesins: chromosomal proteins that prevent premature separation of sister chromatids. Cell, 1997. 91(1): p. 35-45. 20. Glynn, E.F., P.C. Megee, H.G. Yu, C. Mistrot, E. Unal, D.E. Koshland, J.L. DeRisi, and J.L. Gerton, Genome-wide mapping of the cohesin complex in the yeast Saccharomyces cerevisiae. PLoS Biol, 2004. 2(9): p. E259. 21. King, R.W., J.M. Peters, S. Tugendreich, M. Rolfe, P. Hieter, and M.W. Kirschner, A 20S complex containing CDC27 and CDC16 catalyzes the mitosis-specific conjugation of ubiquitin to cyclin B. Cell, 1995. 81(2): p. 279-88. 22. Ciosk, R., W. Zachariae, C. Michaelis, A. Shevchenko, M. Mann, and K. Nasmyth, An ESP1/PDS1 complex regulates loss of sister chromatid cohesion at the metaphase to anaphase transition in yeast. Cell, 1998. 93(6): p. 1067-76. 23. Winey, M., C.L. Mamay, E.T. O’Toole, D.N. Mastronarde, T.H. Giddings, Jr., K.L. McDonald, and J.R. McIntosh, Three-dimensional ultrastructural analysis of the Saccharomyces cerevisiae mitotic spindle. Journal of Cell Biology, 1995. 129(6): p. 1601-15. 24. O’Toole, E.T., D.N. Mastronarde, T.H. Giddings, M. Winey, D.J. Burke, and J.R. McIntosh, Three-dimensional analysis and ultrastructural design of mitotic spindles from the cdc20 mutant of Saccharomyces cerevisiae. Mol Biol Cell, 1997. 8(1): p. 1-11. 25. Winey, M., G.P. Morgan, P.D. Straight, T.H. Giddings, Jr., and D.N. Mastronarde, Three-dimensional ultrastructure of Saccharomyces cerevisiae meiotic spindles. Mol Biol Cell, 2005. 16(3): p. 1178-88. 26. Weiss, E. and M. Winey, The Saccharomyces cerevisiae spindle pole body duplication gene MPS1 is part of a mitotic checkpoint. J Cell Biol, 1996. 132(1-2): p. 111-23. 27. Hwang, L.H., L.F. Lau, D.L. Smith, C.A. Mistrot, K.G. Hardwick, E.S. Hwang, A. Amon, and A.W. Murray, Budding yeast Cdc20: a target of the spindle checkpoint. Science, 1998. 279(5353): p. 1041-4. 28. Buffin, E., C. Lefebvre, J. Huang, M.E. Gagou, and R.E. Karess, Recruitment of Mad2 to the kinetochore requires the Rod/Zw10 complex. Curr Biol, 2005. 15(9): p. 856-61. 29. Cheeseman, I.M., S. Anderson, M. Jwa, E.M. Green, J. Kang, J.R. Yates, 3rd, C.S. Chan, D.G. Drubin, and G. Barnes, Phospho-regulation of kinetochore-microtubule attachments by the Aurora kinase Ipl1p. Cell, 2002. 111(2): p. 163-72. 30. De Wulf, P., A.D. McAinsh, and P.K. Sorger, Hierarchical assembly of the budding yeast kinetochore from multiple subcomplexes. Genes Dev, 2003. 17(23): p. 2902-21. 31. Westermann, S., I.M. Cheeseman, S. Anderson, J.R. Yates, 3rd, D.G. Drubin, and G. Barnes, Architecture of the budding yeast kinetochore reveals a conserved molecular core. J Cell Biol, 2003. 163(2): p. 215-22. 32. Emanuele, M.J., M.L. McCleland, D.L. Satinover, and P.T. Stukenberg, Measuring the Stoichiometry and Physical Interactions between Components Elucidates the Architecture of the Vertebrate Kinetochore. Mol Biol Cell, 2005. 33. Kline-Smith, S.L., S. Sandall, and A. Desai, Kinetochore-spindle microtubule interactions during mitosis. Curr Opin Cell Biol, 2005. 17(1): p. 35-46. 34. Wieland, G., S. Orthaus, S. Ohndorf, S. Diekmann, and P. Hemmerich, Functional complementation of human centromere protein A (CENP-A) by Cse4p from Saccharomyces cerevisiae. Mol Cell Biol, 2004. 24(15): p. 6620-30. 35. Maiato, H., J. Deluca, E.D. Salmon, and W.C. Earnshaw, The dynamic kinetochore-microtubule interface. J Cell Sci, 2004. 117(Pt 23): p. 5461-77. 36. Pearson, C.G., P.S. Maddox, T.R. Zarzar, E.D. Salmon, and K. Bloom, Yeast kinetochores do not stabilize Stu2p-dependent spindle microtubule dynamics. Mol Biol Cell, 2003. 14(10): p. 4181-95. 37. Pearson, C.G., E. Yeh, M. Gardner, D. Odde, E.D. Salmon, and K. Bloom, Stable kinetochore-microtubule attachment constrains centromere positioning in metaphase. Curr Biol, 2004. 14(21): p. 1962-7. 38. Koshland, D.E., T.J. Mitchison, and M.W. Kirschner, Polewards chromosome movement driven by microtubule depolymerization in vitro. Nature, 1988. 331: p. 499-504. 39. He, X., D.R. Rines, C.W. Espelin, and P.K. Sorger, Molecular analysis of kinetochore-microtubule attachment in budding yeast. Cell, 2001. 106(2): p. 195-206. 40. Kosco, K.A., C.G. Pearson, P.S. Maddox, P.J. Wang, I.R. Adams, E.D. Salmon, K. Bloom, and T.C. Huffaker, Control of microtubule dynamics by Stu2p is essential for spindle orientation and metaphase chromosome alignment in yeast. Mol Biol Cell, 2001. 12(9): p. 2870-80. 41. van Breugel, M., D. Drechsel, and A. Hyman, Stu2p, the budding yeast member of the conserved Dis1/XMAP215 family of microtubule-associated proteins is a plus end-binding microtubule destabilizer. J Cell Biol, 2003. 161(2): p. 359-69. 42. Hofmann, C., I.M. Cheeseman, B.L. Goode, K.L. McDonald, G. Barnes, and D.G. Drubin, Saccharomyces cerevisiae Duo1p and Dam1p, novel proteins involved in mitotic spindle function. Journal of Cell Biology, 1998. 143(4): p. 1029-40. 43. Jones, M.H., J.B. Bachant, A.R. Castillo, T.H. Giddings, Jr., and M. Winey, Yeast Dam1p is required to maintain spindle integrity during mitosis and interacts with the Mps1p kinase. Mol Biol Cell, 1999. 10(7): p. 2377-91. 44. Cheeseman, I.M., M. Enquist-Newman, T. Müller-Reichert, D.G. Drubin, and G. Barnes, Mitotic spindle integrity and kinetochore function linked by the Duo1p/Dam1p complex. Journal of Cell Biology, 2001. 152(1): p. 197-212. 45. Cheeseman, I.M., C. Brew, M. Wolyniak, A. Desai, S. Anderson, N. Muster, J.R. Yates, T.C. Huffaker, D.G. Drubin, and G. Barnes, Implication of a novel multiprotein Dam1p complex in outer kinetochore function. J Cell Biol, 2001. 155(7): p. 1137-45. 46. Janke, C., J. Ortiz, T.U. Tanaka, J. Lechner, and E. Schiebel, Four new subunits of the Dam1-Duo1 complex reveal novel functions in sister kinetochore biorientation. Embo J, 2002. 21(1-2): p. 181-93. 47. Jones, M.H., X. He, T.H. Giddings, and M. Winey, Yeast Dam1p has a role at the kinetochore in assembly of the mitotic spindle. Proc Natl Acad Sci U S A, 2001. 98(24): p. 13675-80. 48. Enquist-Newman, M., I.M. Cheeseman, D. Van Goor, D.G. Drubin, P.B. Meluh, and G. Barnes, Dad1p, third component of the Duo1p/Dam1p complex involved in kinetochore function and mitotic spindle integrity. Molecular Biology of the Cell, 2001. 12(9): p. 2601-2613. 49. Li, Y., J. Bachant, A.A. Alcasabas, Y. Wang, J. Qin, and S.J. Elledge, The mitotic spindle is required for loading of the DASH complex onto the kinetochore. Genes Dev, 2002. 16(2): p. 183-97. 50. Westermann, S., A. Avila-Sakar, H.W. Wang, H. Niederstrasser, J. Wong, D.G. Drubin, E. Nogales, and G. Barnes, Formation of a Dynamic Kinetochore- Microtubule Interface through Assembly of the Dam1 Ring Complex. Mol Cell, 2005. 17(2): p. 277-90. 51. Sanchez-Perez, I., S.J. Renwick, K. Crawley, I. Karig, V. Buck, J.C. Meadows, A. Franco-Sanchez, U. Fleig, T. Toda, and J.B. Millar, The DASH complex and Klp5/Klp6 kinesin coordinate bipolar chromosome attachment in fission yeast. Embo J, 2005. 24(16): p. 2931-43. 52. Liu, X., I. McLeod, S. Anderson, J.R. Yates, 3rd, and X. He, Molecular analysis of kinetochore architecture in fission yeast. Embo J, 2005. 24(16): p. 2919-30. 53. Miranda, J.L., P.D. Wulf, P.K. Sorger, and S.C. Harrison, The yeast DASH complex forms closed rings on microtubules. Nat Struct Mol Biol, 2005. 12(2): p. 138-43.